Scientists in South East Asia have been measuring greenhouse gas (GHG) emissions from goats and cattle in a series of research projects investigating the effects of different feeding regimes. In each case, the eructed, or belched, emissions from each animal were measured with a portable FTIR gas analyzer from Gasmet Technologies. The research papers have been published by ‘Livestock Research for Rural Development,’ a peer-reviewed international journal for research into sustainable developing world agriculture. Prof. Reg Preston, who participated in much of the research, says: “With an understanding of the enteric fermentation processes that result in the formation of methane, it is possible to speculate on the effects of changes to the diets of ruminants, so these research projects were designed to test our hypotheses. In each case, the effects of various diets were measured in terms of animal performance criteria such as feed conversion and growth rates, but also in terms of GHG emissions. Atmospheric methane is derived from both natural and anthropogenic sources. Absorbing significantly more energy than carbon dioxide, it performs a major role in global warming. Atmospheric methane concentrations rose during the decade from 2006 to 2016 following a previous decade of near-constant concentrations, so there is global concern about methane emissions. Considerable debate exists around the source of the recent rise in methane levels, but it appears that much of the rise is from biogenic origin so work to reduce ruminant emissions is more important than ever. In each project, the reduction in methane emissions was calculated on the basis that carbon dioxide production reflects energy utilization by the animal, so the ratio of methane to carbon dioxide in eructed gas is a measure of the relative production of methane as a function of the intake of metabolizable energy (Madsen et al 2010; Leng and Preston 2010). Kongvongxay, Preston, Leng and Khang (2011) investigated the effects of four different levels of a tannin-rich foliage (Mimosa pigra) on feed intake, digestibility, nitrogen retention and methane production in four goats fed a basal diet of Muntingia calabura. Each goat was provided with each of the diets for a period of 10 days. Rumen fluid, urine and faeces were chemically analyzed to monitor the effects of the diet, and each goat was placed inside a sealed chamber (made with a bamboo frame and plastic sheeting) after the second and fourth feeding period to measure the methane:carbon dioxide ratio of eructed gas. The results showed the greatest methane reduction (42%) with 72% of the dietary N from mimosa. Sophea and Preston (2011) investigated the effects of different levels of supplementary potassium nitrate replacing urea on the growth rates and methane production in goats fed rice straw, mimosa foliage and water spinach. It was postulated that nitrate could replace carbon dioxide as an electron acceptor in the rumen with the generation of ammonia instead of methane. In this reaction, nitrate is reduced to nitrite and then to ammonia, resulting in lower methane gas emission. Therefore, it was hypothesized that a nitrate salt could potentially replace urea as a source of non–protein nitrogen (NPN) because, as with urea, it would provide a fermentable nitrogen source for microbial protein synthesis. Different levels of potassium nitrate replaced iso-nitrogenous amounts of urea in a diet of fresh mimosa foliage, rice straw and water spinach fed to 12 growing goats in individual cages over an experimental period of 84 days. In this project, rumen gas was collected in expired air using a plastic sleeve and bottle. Gas sampling was undertaken on the last day of the experiment, with each goat breathing into the bottle for 3 minutes before it was tightly closed. The samples were then taken to the laboratory in Nong Lam University, Ho Chi Mih city where the ratios of methane to carbon dioxide were measured with the Gasmet DX4030. There were no differences in liveweight gain across the different diets and concentrations of methane and carbon dioxide in the mixed eructed gas and air were lower for all diets containing potassium nitrate compared with the control with only urea as the NPN source. The relative rate of methane reduction indicated a positive curvilinear trend increasing to 60% reduction when all the urea was replaced by nitrate. The effect of sulphur and calcium nitrate on methane production by weaned goats fed a basal diet of molasses supplemented with Mimosa (Mimosa pigra) foliage was investigated by Silivong, Preston and Leng (2011). Eructed breath in a confined space was analyzed on-site with the Gasmet analyzer. The workers found that this supplemented diet led to a reduction in the methane/ carbon dioxide ratio compared with control animals supplemented with urea. Furthermore, adding 0.8% sulphur as sodium sulphate to the diet also reduced the methane/ carbon dioxide ratio, with the two supplements having additive effects. Supplementary sulphate increased both the digestibility of crude protein and N retention. However, these criteria were not affected by the NPN source. Sangkhom, Preston, Khang and Leng (2012) measured the effect of potassium nitrate and urea as fermentable nitrogen sources on growth performance and methane emissions in sixteen local male ‘Yellow’ cattle fed lime treated rice straw supplemented with fresh cassava foliage. The experiment lasted 120 days, after which concentrations of methane and carbon dioxide were determined in eructed gas in a closed chamber in which the animals were kept for 5 minutes prior to gas analysis. Daily live weight gain and feed conversion were improved by supplementation with nitrate rather than urea. The ratio of methane to carbon dioxide in the mixed eructed gas and air was decreased by feeding nitrate with an overall 25% reduction in methane emission, for animals fed nitrate compared with those fed urea. The effects of NPN source, the level of added sulphur and the source of cassava leaves on growth performance and methane emissions was investigated by Phuong, Khang and Preston (2012). Samples of eructed gas were collected from sixteen growing Laisind female cattle and analyzed with the Gasmet instrument for methane and carbon dioxide using the method described by Silivong et al (2011). The workers found that feed intake was not affected by NPN source, but was depressed by adding 0.8% sulphur and was lower for a treatment with fresh cassava foliage compared with leaf meal. After correcting the data by covariance for differences in initial live weight, growth rate was depressed by adding 0.8% sulphur to the diet but was not affected by the source of NPN or the source of cassava foliage. The ratio of methane to carbon dioxide was reduced by feeding potassium nitrate rather than urea and by fresh cassava foliage compared with cassava leaf meal. Working in Vietnam with twelve female Phan Rang sheep, Thanh, Thu and Preston (2012) studied the effects of potassium nitrate or urea as NPN sources associated with Mangosteen peel (Garcinia mangostana) on methane production, rumen parameters and growth performance. Supplementation with Mangosteen peel decreases the acetic: propionic acid ratio and it was predicted that this would result in a reduction in methane production. The methane: carbon dioxide ratio was determined at 85 days of the experiment using the Gasmet equipment, and it was found that feeding potassium nitrate rather than urea decreased the ratio of methane to carbon dioxide in eructed air from the sheep. There was also a tendency for methane production to be reduced by supplementation with Mangosteen peel. However, neither of the supplements produced any effect on apparent digestibility, N retention, and growth performance. Silivong, Xaykham, Aloun and Preston (2012) investigated the effect of potassium nitrate and urea on feed intake, digestibility, N balance and methane production of goats fed a basal diet of Gliricidia (Gliricidia sepium) and Mimosa (Mimosa pigra) foliages supplemented with molasses. They found that dry matter intake, coefficients of apparent digestibility of DM and crude protein and N retention tended to be higher for goats fed Mimosa compared with those fed Gliricidia. However, in contrast, methane emissions were much lower (by 70%) when Gliricidia was the forage source. There were tendencies for higher values for daily N retention with potassium nitrate compared with urea. In addition, potassium nitrate reduced the methane: carbon dioxide ratio, compared with urea, when Mimosa was the forage source but had no effect when Gliricidia was fed. Leng, Preston and Inthapanya (2012) explored the hypothesis that there will be an additive effect on reduction of methane emissions from adding both biochar (increasing the potential microbial habit) and nitrate to the diet of cattle fed a basal diet of fresh cassava root chips supplemented with fresh cassava leaves. Twelve young local “Yellow” cattle undertook a trial that lasted 98 days following a 21 day period of adaptation to the diets. At the end of the experiment, a sample of mixed eructated and respired gas from each animal was analyzed for methane and carbon dioxide using the Gasmet equipment based on the approach suggested by Madsen et al (2010). Liveweight gain was increased 25% by adding biochar to the diet and tended to be decreased when nitrate replaced urea. Feed conversion was improved by biochar and by urea replacing nitrate. Feed intake was not affected by supplementation with biochar nor by the NPN source. Both biochar and nitrate reduced methane production by 22% and 29%, respectively; the effects being additive (41% reduction) for the combination of biochar and nitrate. Mimosa pigra is an invasive weed, spread by seeds over many areas in South East Asia. However, research such as Silivong et al (2012 – see above) has shown the positive nutritive effects of this foliage, so Hang, Lam and Preston (2012) investigated the effects on sixteen weaned crossbred goats of supplementing the foliage of Melia azedarach with the foliage of Mimosa pigra. The experiment lasted 90 days and the carbon dioxide and methane in eructed gases were measured in the final week by placing the goats in a plastic-covered cage, and after a period of 5 minutes for equilibration, the concentrations were recorded over a 10 minute period, using a Gasmet DX4030 FTIR gas analyzer. The work showed that the replacement of Melia azedarach with Mimosa pigra foliage reduced enteric methane emissions linearly reaching 43% reduction at the 22% level of substitution, after which methane emissions rose again. Growth rates were high (80 to 90 g/day) for all levels of substitution and were unrelated to rate of emissions of enteric methane. As part of part of a series of studies aimed to extend knowledge of the role of nitrate as a competitive electron sink for hydrogen produced in ruminal fermentation of carbohydrate, Sophal, Khang, Preston and Leng (2013) investigated the effect of potassium nitrate as a source of fermentable nitrogen in replacing urea on enteric methane emissions and nitrogen balance. Four male Yellow cattle were fed a basal diet of cassava root chips and fresh cassava foliage with either potassium nitrate fed at 5% of diet DM or urea fed at 1.4% of diet DM. The period on each treatment was 15 days. 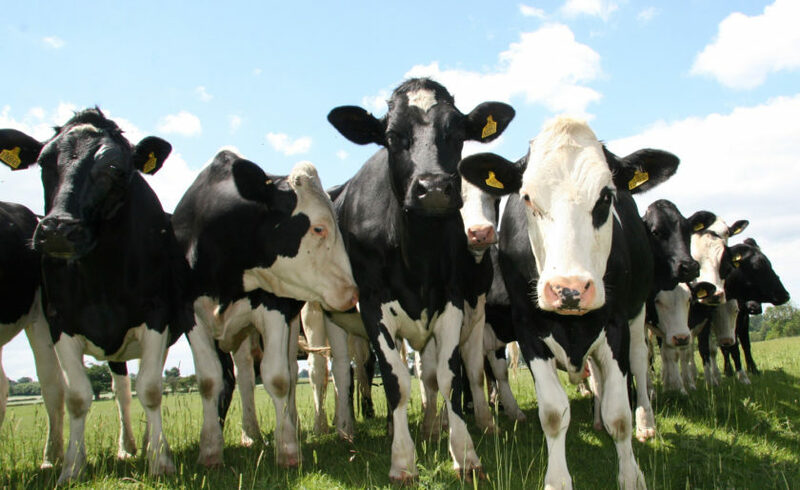 The results showed that providing supplementary non-protein nitrogen as potassium nitrate instead of urea to growing cattle reduced emissions of enteric methane by 43% and increased the rate of N retention per unit organic matter digested by 28%. Inthapanya and Preston (2015) studied the effect of the source of supplementary dietary protein and feed offer level (ad libitum or restricted) on feed intake, digestibility and N balance in male Yellow cattle fed rice straw treated with urea as a basal diet. Water spinach stimulated the intake and digestibility of the basal diet of urea-treated rice straw but this was not reflected in increased N retention which was the same when cassava foliage was the supplement. It was therefore concluded that the protein available for metabolism was the result of increased rumen microbial protein in the water spinach supplement, but for the cassava foliage supplement it was derived from the protein that escaped the rumen digestion. Silivong and Preston (2015) found that the growth performance of goats was improved when a basal diet of the foliage of Bauhinia acuminata and molasses was supplemented with water spinach, a rapidly fermentable protein source, and biochar. In contrast with the report by Leng et al (2014), that biochar reduced methane emissions from cattle fed urea-treated rice straw, in this experiment with goats fed tree foliage, there was no effect of biochar on methane emissions. However, in agreement with these authors, the biochar had a positive effect on growth performance. The hypothesis that protein solubility is an indicator of potential methane production in ruminant animals was developed in research on growing goats fed foliage from cassava or Tithonia diversifolia supplemented or not with water spinach foliage with higher protein solubility. In this work, Porsavatdy, Preston and Leng (2016) found that apparent DM digestibility was higher by 30% for diets based on Tithonia than on cassava foliage and was improved slightly (about 3%) when water spinach was also fed. There was a 21% increase in N retention when cassava was the main foliage rather than Tithonia, but the apparent benefits from giving water spinach were less (about 8%). Methane emissions in eructed gas were reduced by 50% when cassava rather than Tithonia was the main foliage in the diet, and were increased when water spinach was also fed. It is postulated that on such feeds the balance of feed fermented in the cecum/large intestine relative to the rumen is increased. The disposal of hydrogen in fermentation degradation in the cecum-colon appears to be dominated by acetogenesis, which would account for decreased methane production on such diets. “Kilao” – a rice distillers’ by-product (RDB) – is produced in almost all rural villages in Lao, when rice is fermented and distilled to produce rice ‘wine’. It was hypothesized that RDB would have a positive effect on the growth of cattle when ensiled cassava root and cassava foliage were the basis of the diet. Phongphanith and Preston (2016) conducted a trial on twelve cattle, and concluded that there was an interaction between the effects of RDB and biochar. RDB had no effect on methane: carbon dioxide ratios in the absence of biochar but decreased the methane: carbon dioxide ratio by 36% when combined with biochar. Similarly, biochar reduced methane production in the presence of RDB but had the opposite effect in the absence of RDB. Supplementation of a basal diet of ensiled cassava root, urea and fresh cassava foliage with RDB improved growth rates by 37% and feed conversion by 21%. Improvements due to supplementation with biochar were lower (15% for both). The combined effect of RDB and biochar was to increase the live weight gain by 60% (from 300 to 500 g/day). The improvement in feed conversion was 38%. Elephant grass is considered to be the fastest growing plant in the world and could provide the fermentable protein and fiber needed to optimize rumen microbial fermentation of cassava pulp. Duy and Khang (2016) therefore conducted a trial to evaluate the effects on growth rate, and on enteric methane production in Sindhi cattle, when Elephant grass was supplemented with a combination of cassava pulp and coconut oil meal. Twenty female Sindhi cattle were deployed in the trial. At the end of the experiment, a sample of mixed eructed and respired gas from each animal was analyzed for methane: carbon dioxide ratio using the Gasmet DX4030. The cattle were held for 1 hour in a closed chamber before taking the measurements, so that the gases emitted from the animal could equilibrate with the air in the environment. Samples of air in the animal house were also analyzed for the methane: carbon dioxide ratio. The workers found that growth rate was increased, feed conversion was improved and eructed methane decreased with increasing amounts of coconut oil meal in a basal diet of elephant grass and cassava pulp. The solubility of the dietary protein was reduced when the coconut meal concentration in the diet increased and was directly related to the reduction in eructed methane. A direct effect of the coconut oil reducing methane production through indirect effects on the rumen protozoa population may also have contributed to the reduced methane production. The availability of brewers’ grains is limited to locations close to beer factories, Keopaseuth, Preston and Tham (2017) therefore investigated the use of Cassava foliage; replacing brewer’s grains as a protein supplement for twelve Yellow cattle fed cassava pulp-urea and rice straw. The experiment was carried out for 120 days from February to July 2016. At the end of the trial, concentrations of methane and carbon dioxide were measured with a Gasmet DX4030 in eructed gas mixed with air in a closed chamber in which the animals were kept for 20 minutes prior to gas analysis. The maximum growth rate was recorded when the brewers’ grains provided 9-17% of dietary dry matter, and the ratio of methane to carbon dioxide in mixed eructed gas and air declined dramatically with a curvilinear trend as the fresh cassava foliage replaced brewers’ grains in the diet. The cultivation of oil palms in Lao PDR is a recent activity, strongly supported by the Government. This has given rise to local production of biodiesel and with it the availability of crude ‘glycerol.’ Phanthavong, Preston and Leng (2017) therefore conducted an experiment with thirty two Yellow cattle (uncastrated males and females) to evaluate the effect of different levels of glycerol on production parameters and enteric methane production. The experiment ran for 120 days and the basal diet was ad libitum ensiled cassava pulp (with 3% urea), fresh brewers’ grains and rice straw. Other workers have previously conducted experiments demonstrating that crude glycerol may be included in finishing beef cattle diets at levels up to 15% without impairing performance and carcass characteristics. However, Phanthavong et al (2017) showed increased growth rates with a curvilinear trend as the level of glycerol in the diets was increased from 0 to 10.8% in the diet. At the highest level of glycerol the increase in liveweight gain over the control (from 449 to 578g/d) was 29%. Feed conversion rate was not affected by added glycerol. Feeding glycerol resulted in a linear reduction in methane concentration in eructed gas, such that at the highest level of glycerol supplementation the methane concentration was only 30% of that recorded on the control diet without glycerol. The authors speculated that this effect might be due to low crude protein content and the smaller particle size of cassava pulp. Water spinach and cassava foliage can supply a readily fermentable source of protein; providing the peptides, amino acids and ammonia required to enhance the microbial fermentation of fiber in less digestible foliage. Porsavathdy, Do and Preston (2017) therefore conducted an experiment on twelve goats fed a basal diet of pigeon wood foliage (Trema orientalis) supplemented with either sun-dried cassava foliage (Manihot esculenta, Crantz) or water spinach (Ipomoea aquatica). They concluded that goats fed pigeon wood foliage had better growth rates and feed conversion when their diet was supplemented with sun-dried cassava foliage or fresh water spinach, however, the best results were achieved with cassava foliage. Similarly, methane emissions were lower when a supplement was provided; 26% reduction with water spinach, and 41% with cassava foliage. Varieties of cassava can be broadly classified into ‘sweet’ and ‘bitter’ ecotypes according to the level of cyanogenic glycosides that produce hydrocyanic acid (HCN) by plant enzymes when cassava is chopped and also when it is chewed by the animal. HCN is also produced in the rumen by microbial enzymes acting on the glycosides. It has been speculated that brewers’ grains are a source, not just of bypass protein, but also of some factor favoring tolerance to, or capacity to biodegrade, the HCN or its precursors in the ‘bitter’ cassava foliage. Binh, Preston, Duong and Leng (2017) investigated the effects of a low concentration (4% in diet dry matter) of brewers’ grains added to the diet of Lasind cattle fed an ad libitum basal diet of ensiled cassava pulp with urea and a mineral mixture, with bitter cassava foliage. The trial was run over two 56 day periods. In the first period, the cattle fed bitter cassava foliage gained only 61 g/day compared with 383g/day for those fed sweet cassava foliage. In the second period when brewers’ grains were added to this treatment, the liveweight gain was 380g/day. The ratio of methane relative to carbon dioxide in mixed eructed gas-air decreased in the order of treatments in which the diet was supplemented with brewers’ grains, sweet cassava and bitter cassava, respectively. Studies to determine the values of cassava as the basis of an intensive system for fattening cattle were developed in response to the discovery of 10,000 tonnes of cassava pulp that had been deposited as waste over a 4-year period in an open pit at the Indo Chine Tapioca factory in Vientiane, Lao PDR. Extraction of samples to a depth of 10m demonstrated that the cassava pulp had been naturally ensiled with a pH of 3.2. The beneficial effects of brewers’ grains have been demonstrated in a number of trials, but with availability dependent on geographic location, Sangkhom, Preston, Leng, Ngoan and Phung (2017) undertook a 120 day trial with sixteen Yellow fattening cattle fed a basal diet of cassava root fermented with yeast, urea, di-ammonium phosphate (DAP), cassava foliage and rice straw. Half of the animals were also provided with RDP at 4% of predicted DM intake. Supplementation with RDP improved growth rate and feed conversion by 40% and 20% respectively, and the ratio of methane to carbon dioxide in the eructed rumen gas by 26%. Livestock play an important role in Asia, which extends beyond the traditional supply of meat and milk; they are also used for purposes such as draft power, transportation, capital, credit, social value, hides, and provide a source of organic fertilizer for seasonal cropping. Nevertheless, ruminants are significant contributors to atmospheric GHG emissions. It is essential therefore to find ways to reduce these emissions, and the research outlined above demonstrates how significant reductions can be achieved whilst improving animal production and utilising low cost, locally available resources. Leng (1991) pointed out that the first step in developing methane mitigating strategies is to increase productivity, because methane is produced irrespective of whether the animal is at maintenance, or is expressing its genetic potential to produce milk and meat. In each of the above trials, which stretch over 8 years, a portable Gasmet FTIR gas analyzer has been deployed to measure eructed gas from ruminants. A key advantage of this unique analyzer is its ability to operate onsite delivering almost instantaneous measurements for a large number of target gases. Readings can be displayed on a PDA or laptop and recorded spectra can be logged and analyzed with Calcmet™ software. The Gasmet DX4030, and its successor the DX4040, are rugged and simple to operate, which minimises the time required to train new staff and set up trials. Portability, ruggedness, ease of use, independence of mains power, combined with multigas capability, accuracy and sensitivity, make the Gasmet FTIR analyzers ideal for research projects needing to make reliable measurements in rural locations. In summary, the research projects outlined above investigate the effects of diet on livestock productivity, enteric methane emissions and resource efficiency; helping to improve our understanding of the ways in which livestock managers can help in the battles with climate change and rural poverty. Duy N T and Khang D N 2016: Effect of coconut (Cocos nucifera) meal on growth and rumen methane production of Sindhi cattle fed cassava (Manihot esculenta, Crantz) pulp and Elephant grass (Pennisetum pupureum). Livestock Research for Rural Development. Volume 28, Article #197. Hang B P T, Lam V and Preston T R 2012: Effect on growth of goats and enteric methane emissions of supplementing foliage of Melia azedarach with foliage of Mimosa pigra. Livestock Research for Rural Development. Volume 24, Article #227. Inthapanya S and Preston T R 2015: Effect of source of supplementary dietary protein and feed offer level (ad libitum or restricted) on feed intake, digestibility and N balance in local “Yellow” cattle fed rice straw treated with urea as basal diet. Livestock Research for Rural Development. Volume 27, Article #45. Keopaseuth T, Preston T R and Tham H T 2017: Cassava (Manihot esculentaCranz) foliage replacing brewer’s grains as protein supplement for Yellow cattle fed cassava pulp-urea and rice straw; effects on growth, feed conversion and methane emissions. Livestock Research for Rural Development. Volume 29, Article #35. Leng R A 1991 Improving Ruminant Production and Reducing Emissions from Ruminants by Strategy Supplementation. United State Environmental Protection Agency. Office of Air and Radiation, Washington, DC. Leng R A, Preston T R and Inthapanya S 2012: Biochar reduces enteric methane and improves growth and feed conversion in local “Yellow” cattle fed cassava root chips and fresh cassava foliage. Livestock Research for Rural Development. Volume 24, Article #199. Phanthavong V, Preston T R and Leng R A 2017: Glycerol supplementation increased growth rates, decreased the acetate: propionate ratio in rumen VFA, and reduced enteric methane emissions, in cattle fattened on cassava pulp-urea, brewers’ grains and rice straw. Livestock Research for Rural Development. Volume 29, Article #36. Phonethep P, Preston T R and Leng R A 2016: Effect on feed intake, digestibility, N retention and methane emissions in goats of supplementing foliages of cassava (Manihot esculenta Crantz) and Tithonia diversifolia with water spinach (Ipomoea aquatica). Livestock Research for Rural Development. Volume 28, Article #72. Porsavathdy P, Do H Q and Preston T R 2017: Growth rate and feed conversion were improved, and emissions of methane reduced, when goats fed a basal diet of pigeon wood foliage (Trema orientalis) were supplemented with sun-dried cassava foliage (Manihot esculenta, Crantz) or water spinach (Ipomoea aquatica). Livestock Research for Rural Development. Volume 29, Article #68. Sangkhom I, Preston T R, Khang D N and Leng R A 2012: Effect of potassium nitrate and urea as fermentable nitrogen sources on growth performance and methane emissions in local “Yellow” cattle fed lime (Ca(OH)2) treated rice straw supplemented with fresh cassava foliage. Livestock Research for Rural Development. Volume 24, Article #27. Sangkhom I, Preston T R, Leng R A, Ngoan L D and Phung L D 2017: Rice distillers’ byproduct improved growth performance and reduced enteric methane from “Yellow” cattle fed a fattening diet based on cassava root and foliage (Manihot sculenta Cranz). Livestock Research for Rural Development. Volume 29, Article #131. Sengsouly P and Preston T R 2016: Effect of rice-wine distillers’ byproduct and biochar on growth performance and methane emissions in local “Yellow” cattle fed ensiled cassava root, urea, cassava foliage and rice straw. Livestock Research for Rural Development. Volume 28, Article #178. Silivong P and Preston T R 2015: Growth performance of goats was improved when a basal diet of foliage of Bauhinia acuminata was supplemented with water spinach and biochar. Livestock Research for Rural Development. Volume 27, Article #58. Silivong P, Preston T R and Leng R A 2011: Effect of sulphur and calcium nitrate on methane production by goats fed a basal diet of molasses supplemented with Mimosa (Mimosa pigra) foliage. Livestock Research for Rural Development. Volume 23, Article #58. Silivong P, Xaykham O, Aloun O and Preston T R 2012: Effect of potassium nitrate and urea on feed intake, digestibility, N balance and methane production of goats fed a basal diet of Gliricidia (Gliricidia sepium) and Mimosa (Mimosa pigra) foliages supplemented with molasses. Livestock Research for Rural Development. Volume 24, Article #138. Sophal C, Khang D N, Preston T R and Leng R A 2013: Nitrate replacing urea as a fermentable N source decreases enteric methane production and increases the efficiency of feed utilization in Yellow cattle. Livestock Research for Rural Development. Volume 25, Article #113. Sophea Iv and Preston T R 2011: Effect of different levels of supplementary potassium nitrate replacing urea on growth rates and methane production in goats fed rice straw, mimosa foliage and water spinach. Livestock Research for Rural Development. Volume 23, Article #71. Thanh V D, Thu N V and Preston T R 2012: Effect of potassium nitrate or urea as NPN sources associated with Mangosteen peel (Garcinia mangostana) on methane production, rumen parameters and growth performance of Phan Rang sheep in the Mekong Delta of Vietnam. Livestock Research for Rural Development. Volume 24, Article #73.